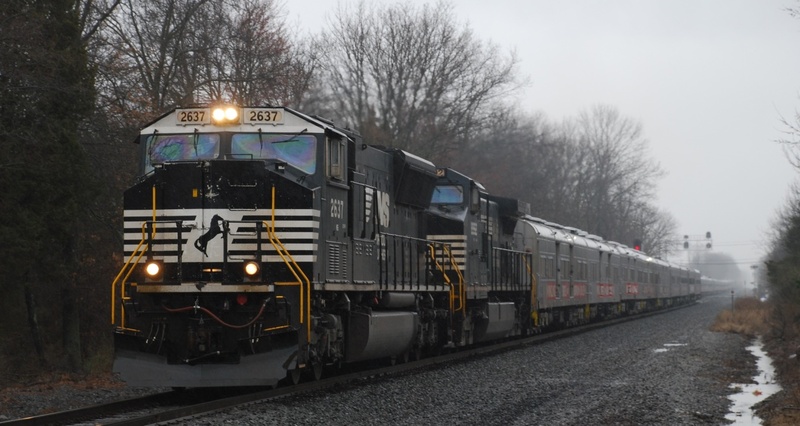 NORFOLK, Va., March 28, 2016 – Norfolk Southern Corporation (NYSE: NSC) will announce its first-quarter financial results during a conference call and live Internet webcast at 4:30 p.m. EDT on Thursday, April 21, 2016. Quarterly earnings results will be released at 4:15 p.m. EDT on April 21, and a press release will be posted at www.nscorp.com under the Investors section. Following the live broadcast, an audio replay of the conference call will be available until April 28, 2016, by dialing 877-660-6853 and access number 13618348. The replay also will be available as an MP3 downloadable podcast in the Investorssection of the company's website. Rather than at Canadian National Railway's former Grand Trunk Western RR 'Level Pebble' yard in southeast Michigan, I wish this meeting had instead taken place at XN interlocking (where the parallel CN Bessemer Subdivision curves and crosses the Norfolk Southern Railway's Meadville Line) at the south end of the CN former Bessemer and Lake Erie RR's Shenango Yard in western Pennsylvania. A very cool and colorful juxtaposition (wherever it happened), nonetheless. NORFOLK, Va., March 23, 2015 -- The board of directors of Norfolk Southern Corp. (NYSE: NSC) has elected Amy E. Miles to serve as chair of the board’s audit committee, effective at the corporation’s 2016 annual meeting of shareholders, said James A. Squires, chairman, president and chief executive officer. Miles succeeds Karen N. Horn, who is retiring from the board effective that same date. Miles has served as a Norfolk Southern director since 2014 and will continue to serve as a member of the board’s finance and risk management committee. She has served as chief executive officer of Regal Entertainment Group Inc., the largest movie theater company in the U.S., since 2009. Prior to that, she served as executive vice president, chief financial officer, and treasurer of the company. Miles joined Regal Cinemas Inc. as senior vice president finance in 1999 after working with Deloitte & Touche LLP and PricewaterhouseCoopers LLP. She serves as a director of Regal Entertainment Group Inc. and Townsquare Media Inc.
Horn has served as a Norfolk Southern director since 2008. She has been a partner with Brock Capital Group since 2003. She served as president of Private Client Services and managing director of Marsh Inc., a subsidiary of MMC, from 1999 until her retirement in 2003. She is a former president of the Federal Reserve Bank of Cleveland. Horn serves as a director of T. Rowe Price Mutual Funds, Simon Property Group Inc., and Eli Lilly and Company. She is vice chairman of the U.S. Russia Foundation, vice chairman of the National Bureau of Economic Research, and a member of the Council on Foreign Relations. 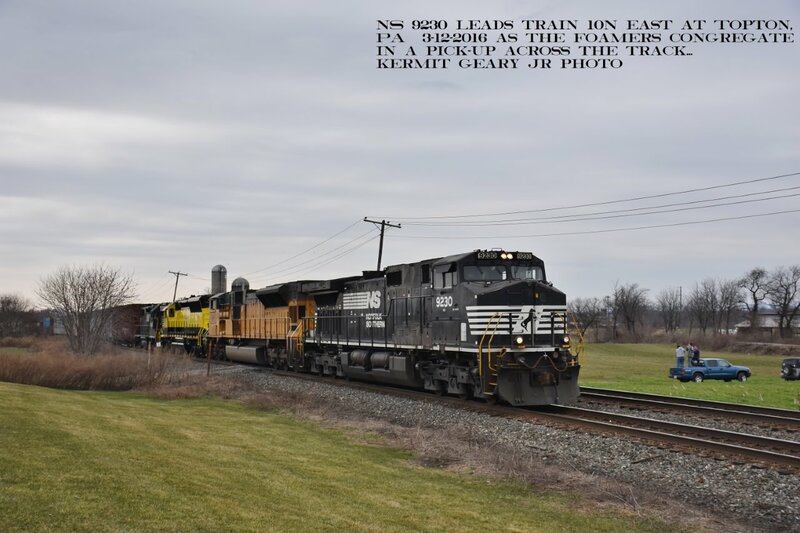 Got a call from a friend informing me that the NS's Interstate heritage unit was leading 33K, a mixed freight heading west from Croxton, NJ to Allentown, PA on Tuesday afternoon. As I crossed over Manville's 13th Street grade crossing a headlight could be seen near Manville yard and was slowly approaching my location. 33K had taken Main 1, formerly known as the Royce Runner, to wait for intermodal 20K. A huge pile of ballast by the grade crossing helped to give me some elevation to photograph it as it traveled down the siding. After 20K had passed, 33K was once again back on the main at CP SULLY in Hillsborough around 4:05. Despite its road grime, it still made for a nice image on this sunny afternoon! That now makes seventeen of the original NS heritage units that I have photographed. NORFOLK, Va., March 22, 2016 – Ann A. Adams has been named vice president human resources at Norfolk Southern Corp. (NYSE: NSC), effective April 1, 2016. She succeeds Juan K. Cunningham, who retired earlier this year. Adams will be responsible for all employment planning and staffing, employee development, employee benefits, compensation, Equal Employment Opportunity compliance, and employee assistance programs and medical services. Her office is in Norfolk. Adams joined Norfolk Southern in 2001 as a human resources manager and subsequently served in a number of HR roles, including recruiting, employee development, planning, and human capital management relating to SAP implementation. Since 2012, she has served as assistant vice president human resources. Before joining Norfolk Southern, Adams founded a business developing customized database applications for retail clothing sales businesses, and served as a product manager for a database application marketing company. Adams holds a B.A. from Davidson College and Ph.D. from Rice University. In 2013, she completed the General Management Program at Harvard Business School. Cunningham joined a Norfolk Southern predecessor railroad in 1973 and served in a wide variety of HR roles, retiring as vice president Jan. 31, 2016. His service included an assignment as assistant vice president executive office, where he coordinated administration of the chairman’s office. The starburst of sun glare reflecting off the near cab corner of 6.4-million-watt (8,600-horsepower) Amtrak electric locomotive #662 is a crisp spot of sharpness...and just about all the rest of photographer Craig Walker's dramatic, panned-action image is an impressive blur of high-speed motion, as passengers rocket south through New Jersey in excess of the Century Mark on the speedometer. 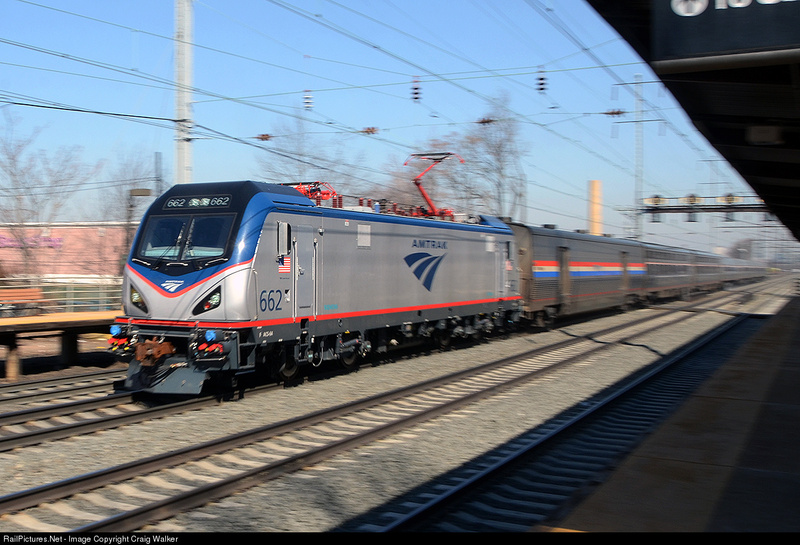 ---NSC "Heading to Florida, Amtrak's train 91, the Silver Star, races through the North Elizabeth, New Jersey [station], on March 9th, 2016. 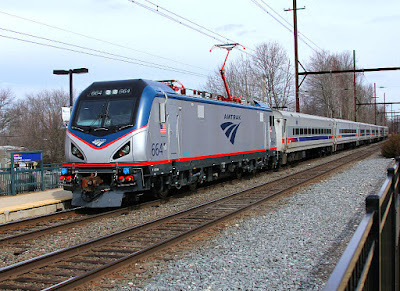 This train, originating in New York, NY, is powered by ACS-64 662 and is traveling on the Northeast Corridor at just over 100 miles per hour." for possible use in a photo display showing her travels. to its original paint scheme. A BIG thank you to everyone who has contributed to make this day happen. Due to the severe flood conditions that Western carriers are experiencing, rail traffic moving through the New Orleans, LA gateway will likely incur delays. Where possible, impacted traffic will be re-routed over alternative gateways. Additionally, some customers may be impacted by embargos issued by Western carriers, which restrict traffic to certain locations. 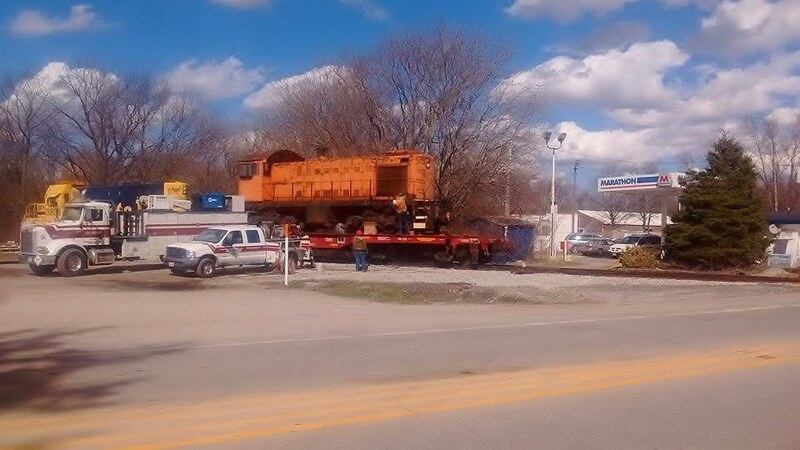 Norfolk Southern continues to closely monitor and adjust operations to minimize traffic delays. 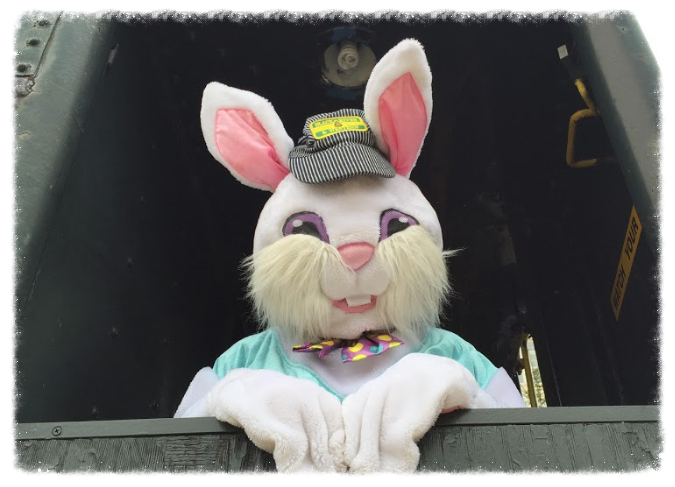 Tickets for the Easter Bunny Express are still available, but going fast! Some departures have sold out, but we still have a limited number of tickets and caboose rentals available. For complete details, times, and ticketsclick here to visit our website. Help us get to Lambertville! Our crews are working on completing rehab work on the remaining 1.5 miles of track to Bowne Station so we can begin running trains to WoodsEdge farm! You can help us get there (1.5 miles closer to Lambertville!) with your donation - large or small - towards our $25,000 fundraising goal. Learn more and donate atwww.lambertvillerail.com! Ringling Bros Blue Unit thru Manville! 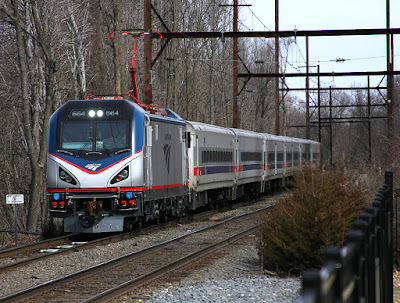 March 14 turned out to be a cold and rainy Monday but that did not dampen my spirits to see Ringling Brothers Blue Unit Circus Train, designated as NS 047, head west over the Lehigh Line as it started its 712 mile trip to Norfolk, VA. The Blue Unit had closed out its engagement at the Prudential Center on Sunday and would open at the Norfolk Scope on March 31st. This train consisted of sixty cars, weighed in at a hefty 4,430 tons and was over a mile long measuring 5,314 feet long. 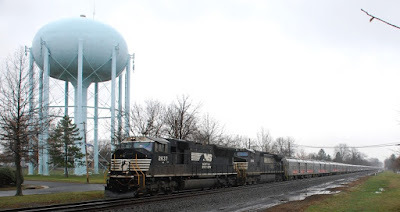 It is seen passing beneath the Manville (NJ) Water Tower on Main 1, formerly known as the Royce Running Track. As to why it took the siding was that coming down the main was NS 054, a special move that consisted of two flatcars loaded with pipes. 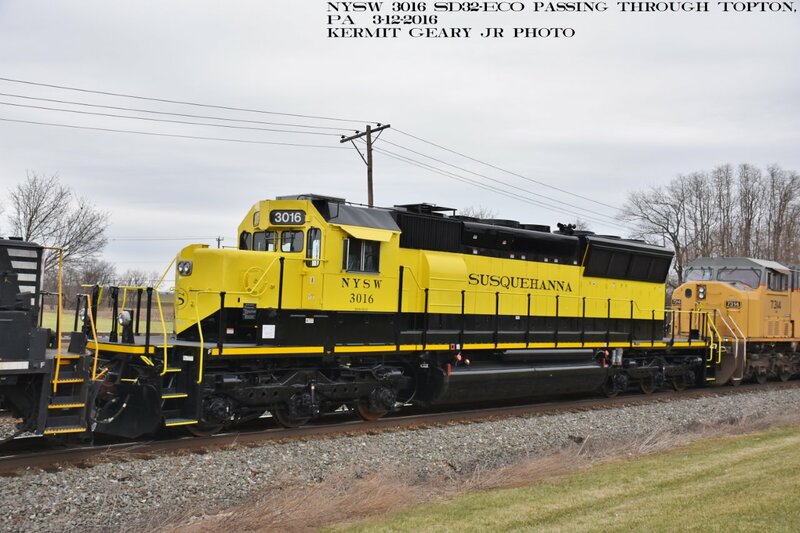 Once that rolling meet was made, NS 047 would once again take the main at CP SULLY and continue its trip west over the Lehigh Line. rectifying the situation! Hope all are well. Pawing through a file of old Conrail-related items, looking for something else. I recently ran across this hard copy of an email I had received from CR Philadelphia headquarters on May 19, 1993, when I was Area Manager - Industrial & Market Development, Asset Development Department, based in Dearborn, MI. 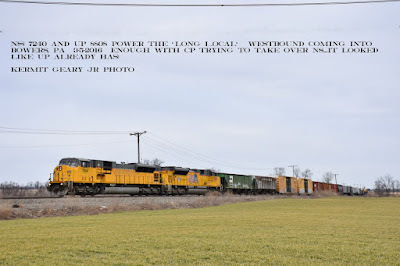 Shortly after this announcement, whenever someone called Conrail's 800 number from anywhere, my recorded voice greeting and instructions would guide the caller through the prompts to reach the right department or business marketing group. With Big Blue coming up on the 40th anniversary of its creation on April 1, I feel honored to have not only located new industries and secured new revenue shipments for the enterprise during my 13 years and 4 months on the payroll, but also to have been chosen to playthis small, enjoyable and unusual role in Conrail's history. Though I had also saved the script sent from HQ that I ultimately recorded, I have not seen that in my 'Conrail things saved' files, yet. I kinda' wish, now, that I had saved an audio file of it, too. 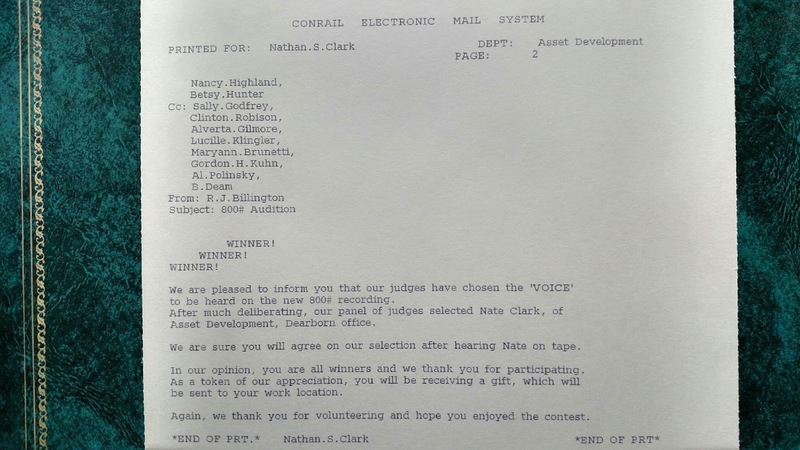 There were another 28 'voices' that auditioned, that I know of, and I was proud to have worked with them all as fellow employees, during my time with Conrail. 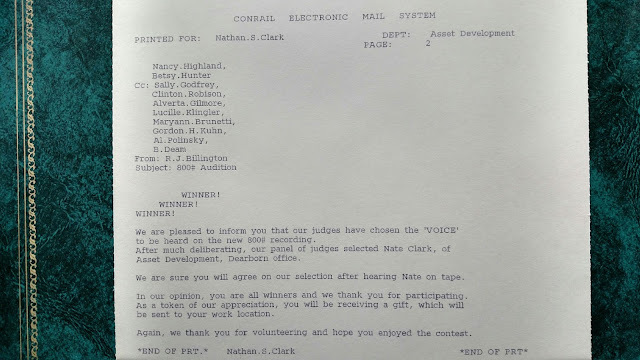 Less than a half-dozen years later, Conrail would be divided up between its two major eastern rivals, and its 'voice' would be silenced, forever. 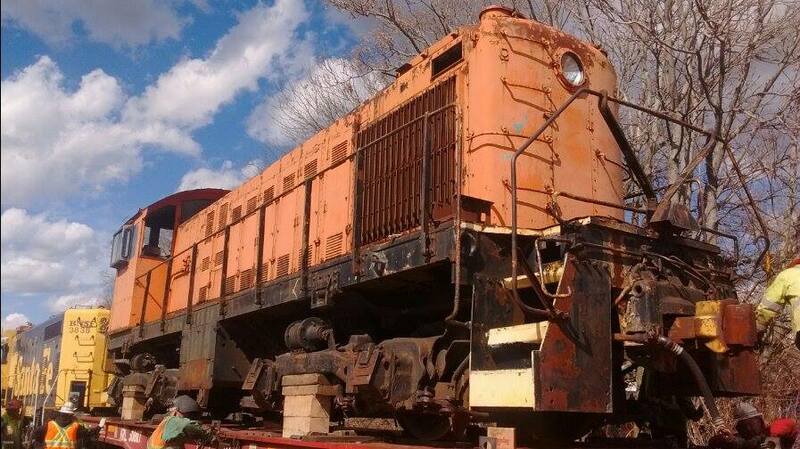 Except for those who continued on with the jointly-held Conrail Shared Assets terminal areas in Michigan, Pennsylvania and New Jersey, the rest of us would become what are now affectionately known as "ex-Cons". In its finals years, Conrail was a powerhouse in the industry and a standard against which some very large, important shippers later said their other rail carriers had been measured. The two acquiring roads launched a fierce bidding war for the CR 'franchise', and ultimately, each was willing to pay a considerable premium to buy just a portion of what Conrailers across the system had built. From the ashes of the bankrupts in 1976, it had become a great place to work and its people were the best. I cherish my memories of that time and am grateful to have had the opportunity to be a part of it. 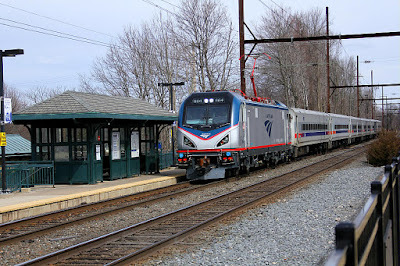 Amtrak unit on SEPTA train on former Reading trackage! Strange to see THIS on home turf! Only one test run today, it should be visiting other lines on the system. 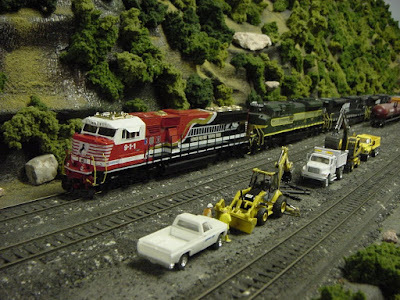 Come and visit our tables for great prices on a huge variety of model trains! 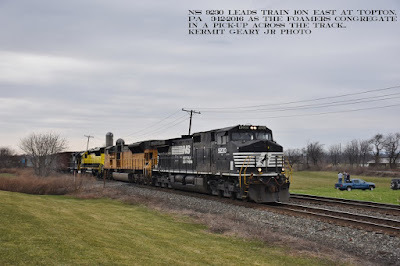 Norfolk Southern First Responders Tribute unit #911 and their ERIE RR Heritage unit grind upgrade with a unit coal unit train, past a Maintenance Gang on Ken Heyl's vast Cincinnati and Southern RR HO empire in Ashland, Ohio. The last day to mail your registration is March 5. Walk in registrations will be available starting at 5:30pm Friday March 18 at the Desmond. JACKSONVILLE, Fla. – March 2, 2016 – Frank Lonegro, CSX Corporation (Nasdaq: CSX) executive vice president and chief financial officer, will address the J.P. Morgan Aviation, Transportation and Industrials conference in New York City on Wednesday, March 9, at 8:30 a.m. Eastern time. 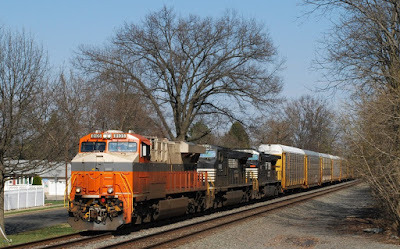 JACKSONVILLE, Fla. – March 2, 2015 – CSX (Nasdaq: CSX) today appointed new engineering leaders following the announcement that John West, vice president-engineering, will retire on April 1 after 37 years of dedicated service to the railroad. Ricky Johnson has been named vice president-engineering beginning April 1, reporting to Cindy Sanborn, executive vice president and chief operating officer. Johnson joined CSX as a roadmaster in 2001 and has progressed through the engineering department, with roles as assistant division engineer of track, division engineer, assistant chief of system production, and most recently as chief engineer maintenance of way (MOW) north. 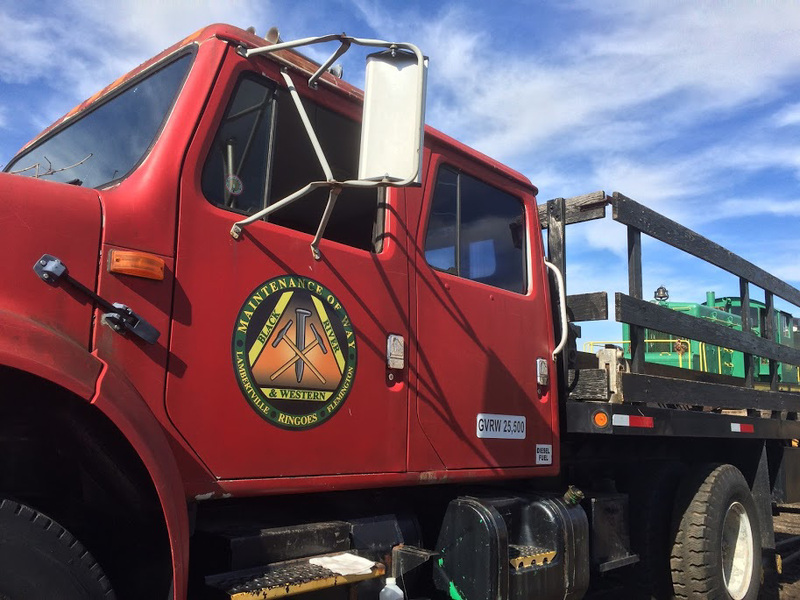 A military veteran, Johnson earned an MBA from the University of Maryland, and is a member of the American Railway and Maintenance of Way Association. Moving into the role of chief engineer MOW north is Greg Mellish, formerly chief engineer MOW south. 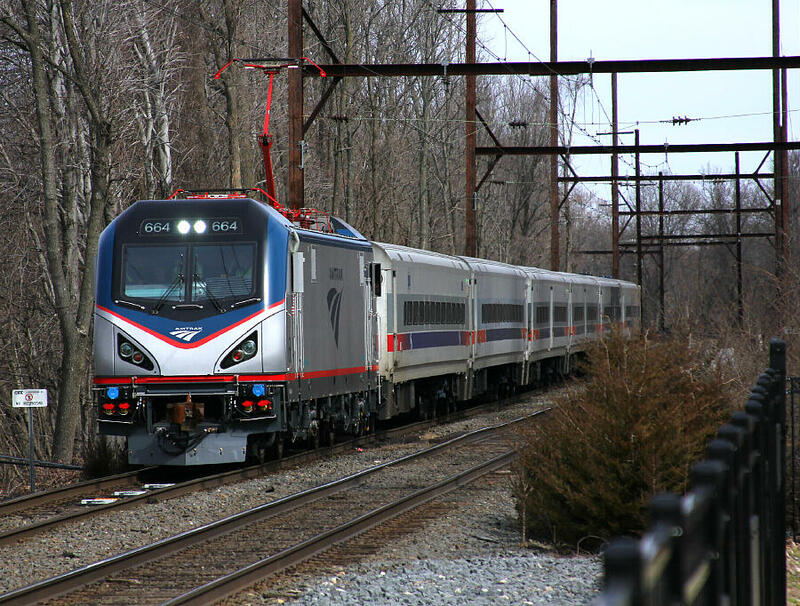 A 38-year CSX veteran, Mellish has significant field experience, including as assistant chief engineer and division engineer in Baltimore, Florence, Louisville, Nashville and Albany. He holds an undergraduate degree in engineering from the University of Delaware and earned an MBA from the University of Buffalo-State University of New York (SUNY). 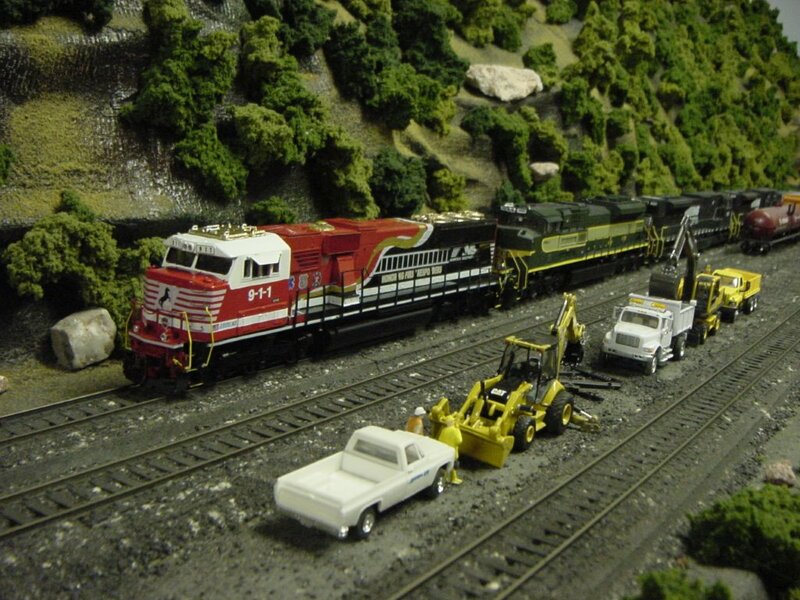 Mellish is a licensed Professional Engineer and a member of the American Railway and Maintenance of Way Association. Lee Moss is named chief engineer MOW south, after most recently serving as assistant chief engineer. Moss has 20 years of management experience with CSX following several years of additional railroad experience. He has progressed through several cross-functional operations leadership roles, including as director of network modeling and division engineer. Moss earned undergraduate and master’s degrees in Civil Engineering from North Carolina State University, and is a member of the American Railway and Maintenance of Way Association. Moving into the role of assistant chief engineer is Eric Pachman, previously director of network modeling and analytics. Pachman joined CSX in 2011 after working in engineering at the Dow Chemical Company and ExxonMobil, and in finance and analysis with Morgan Stanley and Korsant Partners, LLC. Pachman’s strategic perspective will help the Engineering Department leverage the multitude of available data to continue creating a more predictive and proactive network approach. He holds an undergraduate degree in chemical engineering from the University of Florida and an MBA from the Harvard Business School. NORFOLK, Va., March 1, 2016 – Norfolk Southern today announced it is consolidating its three operating regions into two, effective March 15. The decision to further streamline railroad operations is part of the company’s ongoing execution of its five-year strategic plan, announced in December 2015, to enhance operating efficiencies, reduce costs, drive profitability, and accelerate growth. As previously announced, NS is targeting annual expense savings of $650 million by 2020. Earlier this year, Norfolk Southern streamlined division operations by combining the former Virginia and Pocahontas divisions into a larger Pocahontas Division. 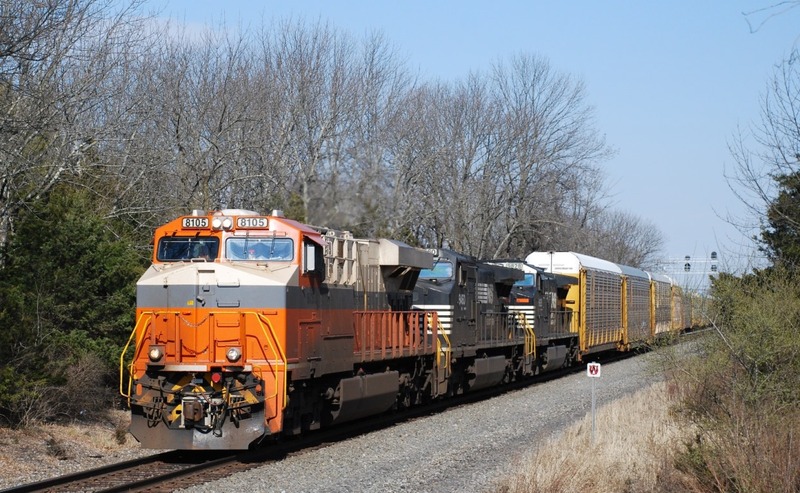 This became effective Feb. 1, and followed other key strategic initiatives including the reduction from three corporate office locations to two, restructuring of the Triple Crown Services subsidiary, integration of the D&H South Line to increase options for shippers, and idling of certain parts of the ‘West Virginia Secondary’ line. Norfolk Southern’s network spans 22 states in the eastern U.S. 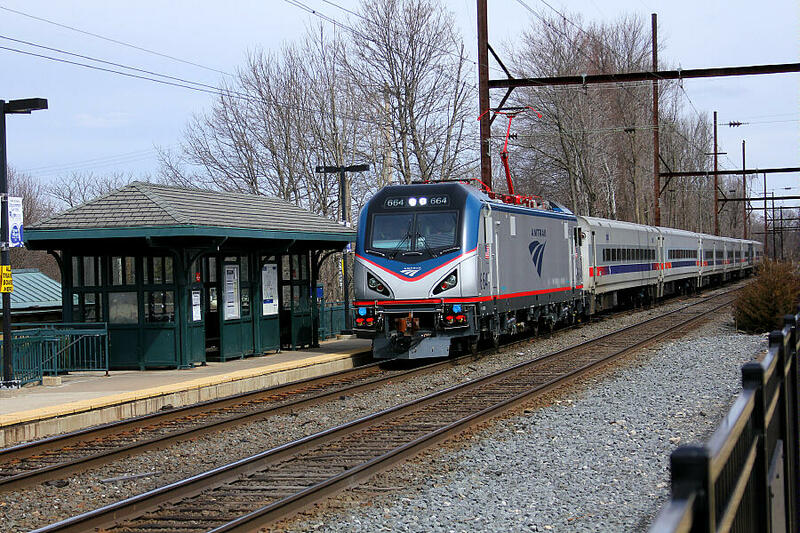 The railroad presently manages train operations across 10 operating divisions that are part of three larger operating regions – the Eastern, Western, and Northern regions. 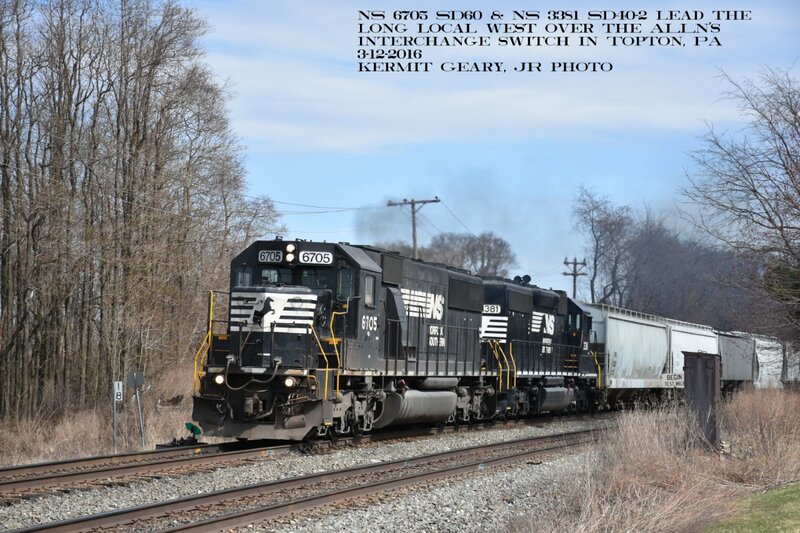 Under the new structure, effective March 15, Norfolk Southern’s network will be divided into Northern and Southern regions only. The Northern Region will include the Harrisburg, Pittsburgh, Dearborn, Lake, and Illinois divisions. Greg Comstock, a 41-year veteran of Norfolk Southern operations, will be the region’s general manager. The region’s chief engineers will be Eddie Otey, maintenance of way and structures, and Mick Ireton, communications and signals. The Southern Region will include the Piedmont, Alabama, Georgia, Central, and Pocahontas divisions. Todd Reynolds, a 22-year veteran of Norfolk Southern operations, will be the region’s general manager. The region’s chief engineers will be Lucious Bobbitt, maintenance of way and structures, and Randall Smith, communications and signals. 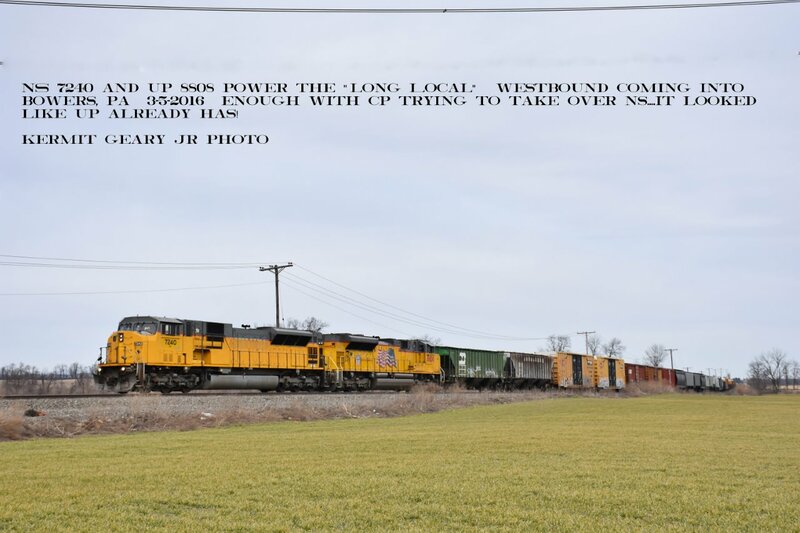 Each of the two consolidated regions will support approximately 1,000 daily crew starts for long-haul train operations, connecting customers and communities to global markets with freight rail that moves consumer goods, automobiles, coal, grain, and products essential to U.S. households, businesses, and industries. Certain statements herein are “forward-looking statements” within the meaning of the “safe harbor” provisions of the Private Securities Litigation Reform Act of 1995, as amended. These statements relate to future events or the Company’s future financial performance and involve known and unknown risks, uncertainties and other factors that may cause the actual results, levels of activity, performance or achievements of the Company or its industry to be materially different from those expressed or implied by any forward-looking statements. In some cases, forward-looking statements can be identified by terminology such as “may,” “will,” “could,” “would,” “should,” “expect,” “plan,” “anticipate,” “intend,” “believe,” “estimate,” “project,” “consider,” “predict,” “potential” or other comparable terminology. The Company has based these forward-looking statements on management’s current expectations, assumptions, estimates, beliefs and projections. While the Company believes these expectations, assumptions, estimates, and projections are reasonable, such forward-looking statements are only predictions and involve known and unknown risks and uncertainties, many of which involve factors or circumstances that are beyond the Company’s control. These and other important factors, including those discussed under “Risk Factors” in the Company’s Form 10-K for the year ended Dec. 31, 2015, as well as the Company’s subsequent filings with the Securities and Exchange Commission, may cause actual results, performance or achievements to differ materially from those expressed or implied by these forward-looking statements. The forward-looking statements herein are made only as of the date they were first issued, and unless otherwise required by applicable securities laws, the Company disclaims any intention or obligation to update or revise any forward-looking statements, whether as a result of new information, future events or otherwise. Copies of Norfolk Southern Corporation’s press releases and additional information about the Company are available at www.norfolksouthern.com or you can contact the Norfolk Southern Corporation Investor Relations Department by calling 757-629-2861. 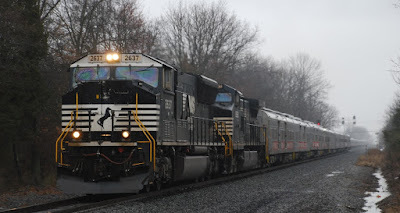 Norfolk Southern Corporation (the “Company”), its directors and certain of its executive officers and employees may be deemed to be participants in the solicitation of proxies from stockholders in connection with the Company’s 2016 Annual Meeting of Stockholders (the “2016 Annual Meeting”). The Company plans to file a proxy statement with the Securities and Exchange Commission (the “SEC”) in connection with the solicitation of proxies for the 2016 Annual Meeting (the “2016 Proxy Statement”). Additional information regarding the identity of these potential participants, none of whom owns in excess of 1 percent of the Company’s shares of Common Stock, and their direct or indirect interests, by security holdings or otherwise, will be set forth in the 2016 Proxy Statement and other materials to be filed with the SEC in connection with the 2016 Annual Meeting. This information can also be found in the Company’s definitive proxy statement for its 2015 Annual Meeting of Stockholders (the “2015 Proxy Statement”), filed with the SEC on March 25, 2015, or the Annual Report on Form 10-K for the year ended Dec. 31, 2015, filed with the SEC on Feb. 8, 2016 (the “Form 10-K”). To the extent holdings of the Company’s securities by such potential participants have changed since the amounts printed in the 2015 Proxy Statement, such changes have been or will be reflected on Statements of Ownership and Change in Ownership on Forms 3 and 4 filed with the SEC. STOCKHOLDERS ARE URGED TO READ THE 2016 PROXY STATEMENT (INCLUDING ANY AMENDMENTS OR SUPPLEMENTS THERETO), 2015 PROXY STATEMENT, FORM 10-K AND ANY OTHER RELEVANT DOCUMENTS THAT THE COMPANY HAS FILED OR WILL FILE WITH THE SEC CAREFULLY IN THEIR ENTIRETY WHEN THEY BECOME AVAILABLE BECAUSE THEY WILL CONTAIN IMPORTANT INFORMATION. Stockholders will be able to obtain, free of charge, copies of the 2016 Proxy Statement (when filed), 2015 Proxy Statement, Form 10-K and any other documents (including the WHITE proxy card) filed or to be filed by the Company with the SEC in connection with the 2016 Annual Meeting at the SEC’s website (http://www.sec.gov) or at the Company’s website (http://www.nscorp.com) or by writing to Denise Hutson, Corporate Secretary, Norfolk Southern Corporation, Three Commercial Place, Norfolk, Virginia 23510.